Oath Pizza is opening in Ardmore. Soon, Oath Pizza will open in Ardmore's Suburban Square. Founded in 2015 in Nantucket, Mass., the chain has locations in Boston, New York and Washington D.C. The Ardmore location will be the first for Pennsylvania. 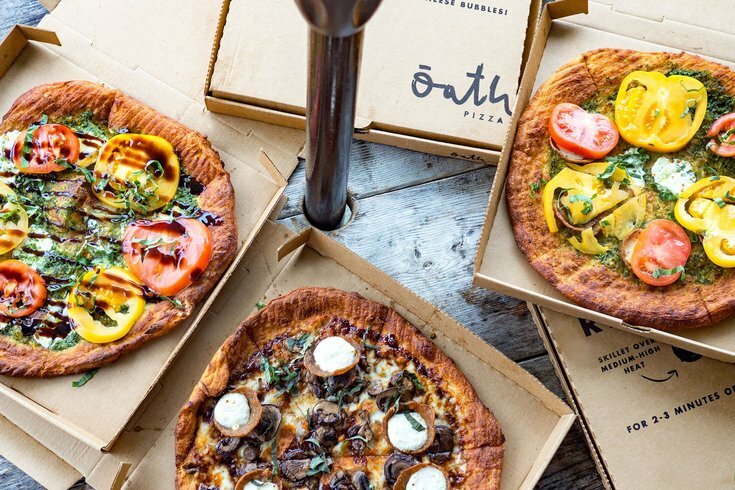 Oath Pizza offers customizable pies, made with fresh, sustainably-sourced ingredients, and is known for its signature thin crust that is grilled and seared in avocado oil. There are no chemicals, hormones or antibiotics used. The company also received Humane Farm Animal Care's certified-humane approval, certifying that its toppings are sourced from farms that meet the program's standards of ethical and humane animal treatment. You can pick and choose your toppings, or order one of the speciality pizzas like the "Spicy Mother Clucker," made with mozzarella, pickled red onions, spiced chicken, sriracha, spicy aioli and scallions. There are gluten-free options, too. In addition to pies, Oath Pizza offers salads, breakfast and a chocolate chunk cookie pizza. An exact opening date hasn't been announced, yet, but it's looking like sometime in November. When the shop has its grand opening, Oath Pizza promises "half your pizza on the house." The new pizza joint will be located at 59 Saint James Place.